Besides the relaxing sail, amazing SUNSET and trip from Docklands to Williamstown, Port Melbourne and St. Kilda Beach; Melbourne’s skylines will never look as beautiful as they do on the Reggae Cruise! On the decks we will have our resident DJ Zare Demus from Jamaica, founder of Australia Reggae Radio alongside the funky Ethan Manchild from Break The Chain Radio Show from PBS 106.7FM Melbourne and one of Australia's finest DJ Agent 86! All Reggae Cruise ticket holders will have a free entry at the longest running Reggae Party in Australia at the More Fire at Deep 11. 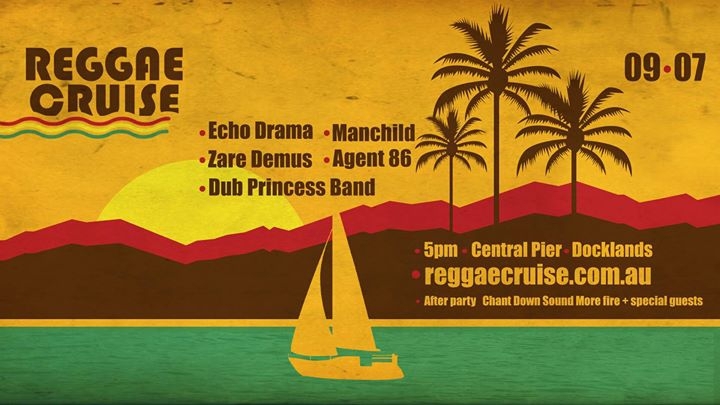 They will be featuring Chant Down Sound with Jesse Hype from Babylon Burning radio show (PBS FM) + many special guests to be announced!